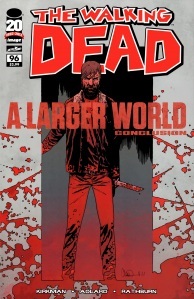 The conclusion to ‘A Larger World’ is intriguing, though let down in part by the ending, where Rick gives another grandstand speech that is more Hollywood than Woodbury. That is not to say this issue is poor by any means, but the tendency to let Rick espouse at length is now a common trend in this comic book, and it is not one of the books strengths. So, this story arc was essentially a foundation stone, setting up a bigger storyline, which will develop as we move towards issue #100. We now have a better understanding of The Hilltop communities situaiton, and the threat that looms over them. This issue also further develops the change in Rick Grimes. The man who would do anything to keep his surviving family safe will go to some extreme lengths to ensure this. But I also think that we are seeing the gradual shift from Hero to anti-Hero to Villain. That famous truism ‘Power Corrupts’ is a constant nagging feeling as you witness Rick verbalise his thoughts. The art seemed a little different this issue, a little sparser, with less detail. Some of the big splash pages were really well done. Considering Charlie Adlard is producing one of these at a rate to ensure The Walking Dead ships every 3 weeks until issue 100, the end product should be commended. He is the rock of this creative team, and he keeps on delivering. Another grumble; I accept that, for economic terms, the monthlies need to be rounded up, story-wise, for Trade considerations, but does every story-arc now also need a sub-heading to absolutely sign-post the reader through the plot? As ‘A Larger World’ ends, so ‘Something To Fear’ begins. I find it unneccesary. I used to like it when it was just called ‘The Walking Dead’, without the unnecessary exposition implicit in giving these story-arcs titles and splashing them all over the cover. And it makes the covers look messy and takes some of their power / attractiveness away. The ending. It gave enough for us to understand that we are a long way from being done with Hilltop and its external threats. You came away absolutely understanding what a tight team Rick has around him. But his speech at the end was just hyperbolic and way too cheesy. 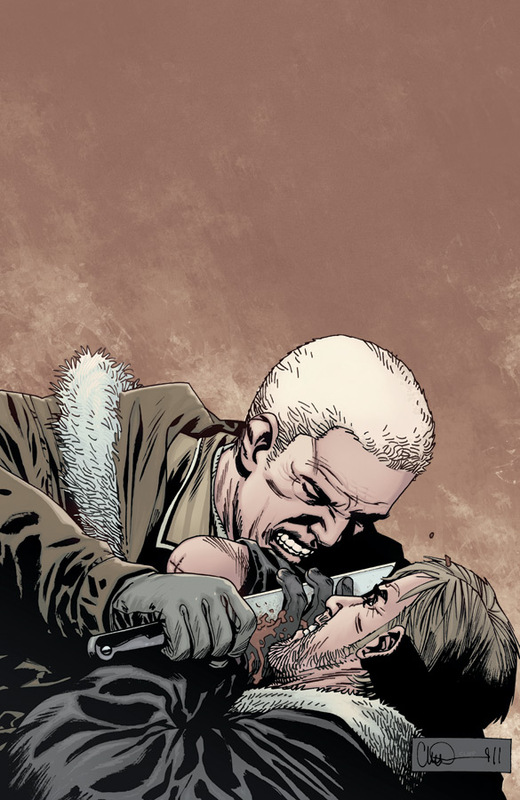 Robert Kirkman has a tendency more and more to let the dialogue impede the flow of the story. There is less economy with words, and the verbosity can grate. It does here. I understand the sentiment that Rick is espousing, and I think that this will make for exciting plot development. But its the execution that sometimes fall short, not the ideas. 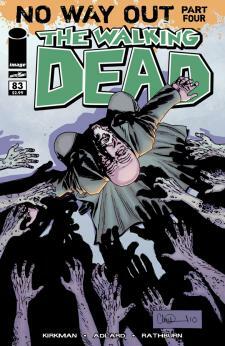 This is a review of issue 95 of The Walking Dead, and contains mild SPOILERS! The Walking Dead tends to stick to a cyclic plot progression. Rick & co. meet new people, new people have own community, Rick & co. unsure / wary of new community, eventually all hell breaks loose, and their may be some zombies thrown into the mix (just to remind you that though the living are the real threat, this is generally marketed as a ‘Zombie’ comic). Rick & co. regroup, and the whole cycle starts again. Issue #95 (or ‘part 3 of A Larger World’ if you prefer) is no exception to this tried and tested formula. Rick & co. have been taken to the gates of a walled community (aka ‘Hilltop Colony’), to be introduced and welcomed into it. Several issues have led up to this particular moment, as we have seen Rick struggle with his natural instinct of distrust and finally come to an understanding with ‘Jesus’ (aka Paul Monroe), the advanced scout / lead recruiter for this new community. We are given a snapshot of life within the walls of ‘Hilltop’ thanks to Adlard’s great pencils, showing bored sentry guards, rows of trailers, a fantastic Stately building and scores of people going about their business. That’s a good thing by the way. These final pages left me really impressed, especially the final shot of Rick and his apparent nonchalance to the events that had just occurred. For the first time in ages, I really do not know where this series is going next. 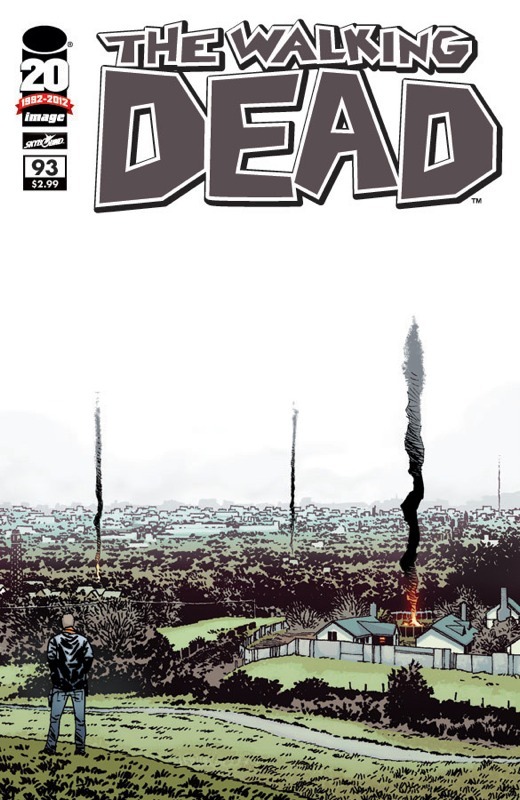 Again, that’s a good thing, as the unpredictability of issue 95 left me with the distinct impression that Kirkman is planning something superb for his centenary celebrations on The Walking Dead. I really hope he can deliver on the promise of this current instalment. Rick and his group are welcomed into a new community, led by a new charismatic leader. Rick has experienced this before. Is this the beginning of a new era of peace for Rick and the others… or is this man every bit as dangerous as The Governor? 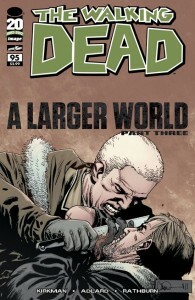 “The Walking Dead” announcements include the new story arc “A Larger World” where our favorite survivors are going to encounter many more survivors. Kirkman also told us that the story is intended to go for “years and years and years” and still “feels like he’s just getting started” and has some vague ideas about how the story will end.